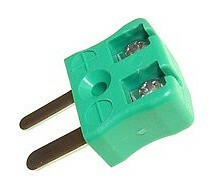 Thermocouple compatible plugs for various thermocouple types in IEC colours. They feature flat pins and the terminals and contacts are made from material suitable for the thermocouple type. 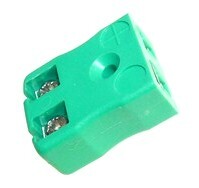 Two pin miniature size thermocouple connector sockets for various thermocouple types in IEC colours. The terminals and contacts are made from material suitable for the thermocouple type. Miniature connector with flat pins simply push-in wire and tighten for rapid termination. Useful for calibration and on-site work. Maximum continuous operating temperature: 220°C. Miniature socket with thermocouple contacts simply push-in wire and tighten screw for rapid termination. Useful for calibration and on-site work.